If you haven’t heard of the Kumon method, now’s the time to prick up your ears. The Kumon method, based on a logical, simple step-by-step approach, started in Japan in 1958, to help children and teenagers supplement their learning. Since then, the philosophy has grown, and the Kumon workbooks have become a trusted way for children to build their reasoning skills, pencil skills, and numeracy. The Speed & Accuracy Math Workbooks have been created for children aged six and up, and aims to help them solve math problems efficiently and accurately. This book gradually grows more difficult as your child progresses – but never too difficult! 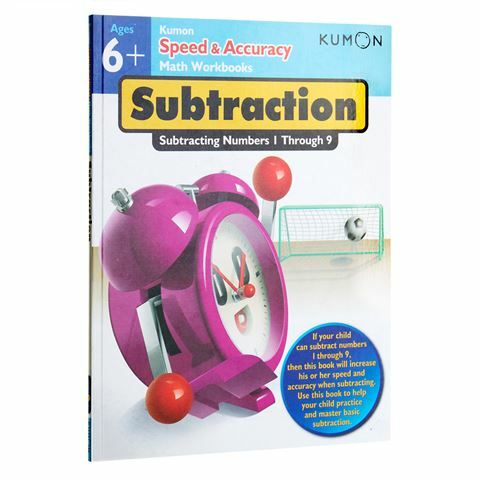 Within the Subtraction version of these workbooks, children will learn simple subtraction, subtraction with and subtraction without borrowing. They’ll also have the chance to record how long it takes for them to complete activities so that they can see improvement over time. By the time they’ve finish this book, your child will have mastered their skill completely – just as the Kumon method encourages. Suitable for children aged six and up, or children who can add numbers 1 through 9. Children will learn how to add the numbers 1 through 9 with and without carrying. Mixed addition is also included. Step-by-step activities with space on each page to time how long it takes to complete each one. Focuses on one concept of addition at a time, so children grasp each one completely. Encourages children to work on their own.